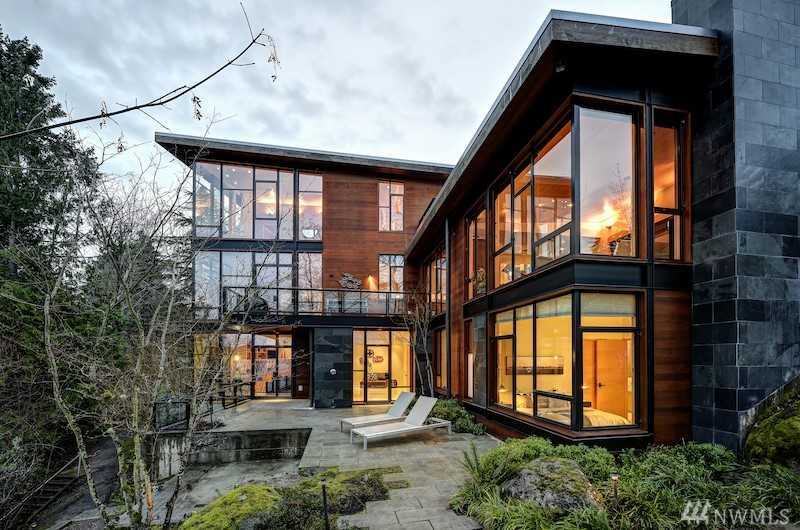 Iconic architecturally-advanced home offered on 113′ of Lake WA no bank frontage. Designed by Geoffrey Prentiss. Built of steel and glass, softened by calibrated Montana slate and clear cedar. Maple-paneled ceilings, Wenge African hardwood. Hand-troweled Milestone bathroom walls. Radiant floor heating throughout. Low maint natural landscaping. 2 patios. 3 decks. Boat lift. Bald eagles. 500 sq ft apt above 3-car garage. This is premier PNW lakefront living. Directions: From Juanita Dr NE, Simonds Rd NE or 68th Ave NE, enter Inglewood Rd NE at the golf course entrance. Follow Inglewood Rd NE for approximately .5 miles. Home is on the right.